If you're missing a tooth, you're in good company: Some 70% of the U.S. population is also missing at least one, usually a back tooth (molar). Adult teeth are often lost due to decay, gum disease, failed root canal therapy, or fracture — particularly if they have already been heavily restored with fillings or crowns. When it comes to replacing a lost tooth (or even two or three adjacent teeth) there are generally two treatment options available: the old standby, fixed bridgework; or the modern, high-tech solution, dental implants. While either one can offer an aesthetically pleasing and functional replacement, there are some important differences between the two methods of treatment. To help you decide which one is right for you, let's take a closer look at each technology. Although an early type of dental bridge was used by the Etruscans around 700 BC, the modern bridge (also called a fixed partial denture) first became available in the early 20th century. The part which replaces missing teeth, called a “pontic” (French for bridge), is fixed in place by attachment to adjacent, healthy teeth, called “abutments.” The pontic is made to resemble a row of natural teeth joined together; how many teeth it will consist of depends on how many are missing. For example, if just one tooth is gone, a three-unit fixed bridge will be needed. This consists of a replacement for the missing tooth (the pontic), plus a crown for each of the two teeth adjacent to the gap. If more teeth are missing, more units would be required in the bridge. A seven-unit bridge might be needed for three missing teeth; this would consist of three replacement teeth, plus four crowned abutment teeth — two on each side of the gap — to handle the extra stresses. The crowns fit over the tops of the abutment teeth, which must be prepared (re-shaped by the removal of tooth structure) to receive them — and therein lies a problem. In order to securely attach the crowns, the enamel (and some dentin) must be removed from the abutment teeth. This renders these otherwise healthy teeth more susceptible to decay; it may also necessitate root canal treatment. Additionally, if existing crowns are present, they will have to be removed and redone. The potential problems don't end when a bridge is in place. Because of the way bridgework “sits” below the gums, there is an increased potential for gum disease in the area. Plus, because a bridge requires that two teeth do the work of three (or more), the forces at work in the mouth generally cause the system to fail over time. Ten years is considered a good lifespan for a well-cared-for bridge. Beginning in the late 1970s, dental implants became available in the United States. This remarkable system for tooth replacement relies on the osteophilic (bone-loving) properties of titanium, the metal from which the below-gum part of the implant tooth is made. Placed directly into the bone of the jaw, an implant fuses with the living bone tissue, making it sturdy and long-lasting. The lifelike crown on top makes it virtually indistinguishable from the natural teeth. If you have one missing tooth, you need just one implant — healthy adjacent teeth aren't affected. A greater number of lost teeth can often be replaced by a smaller number of implants, with no need to compromise the teeth nearby. Plus, while the chance of tooth decay is eliminated, the potential for gum disease isn't increased. In fact, with normal brushing and flossing, a dental implant can last a lifetime. 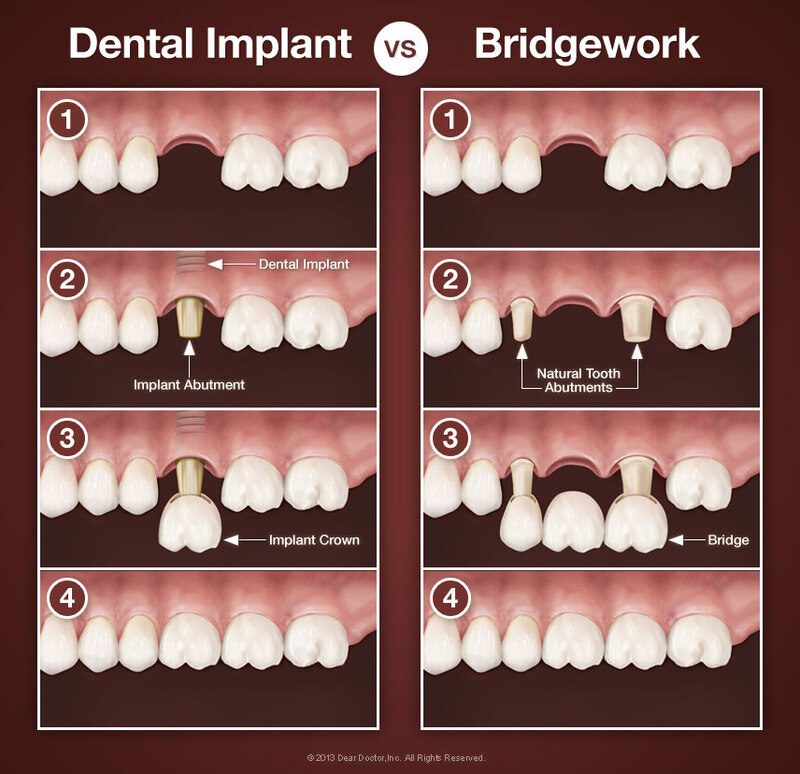 Implants generally cost more than bridgework initially — but they have been shown to be the most cost-effective long-term option. They also have other advantages, including one that no other tooth replacement system offers: the ability to stop the loss of bone, which invariably occurs after tooth loss. So when you're weighing your tooth-replacement options, it pays to consider the long-term value of dental implants.